Clearly, “Fiddler on the Roof” still has plenty of fans. It also has new interpreters. This summer, two local groups will tackle the show in entirely different ways, tailoring the productions for their own members. On Aug. 8, members of Maywood’s Adler Aphasia Center will perform the show, directed by staff speech pathologists Karen Castka and Ginette Abbanat. Rehearsals began in March. Twenty-four people with aphasia will take part in the show, while another half dozen will assist with costumes and scenery. The actors – a microcosm of the center in general – come from all over Bergen County. Castka said the play will be tailored specifically for center members. Members also can choose to sing. The Adler Aphasia Center, founded by Mike and Elaine Adler in 2003, is working to make aphasia universally understood. It provides a therapeutic environment with innovative programs for people with aphasia, conducts research on the issue, and trains health care professionals to improve service delivery. According to Castka, though members suffer from communication disorders due to stroke, head trauma, accident, brain cancer, or surgery, the disorder does not affect their intellect. Activities such as the upcoming production of “Fiddler” enable them to improve their communication skills while having fun at the same time. “Members love the show,” she said, noting that productions usually draw some 200 audience members, many of them the performers’ friends and relatives. “They have a great time. It’s a huge accomplishment,” she said, pointing out that the actors ordinarily aren’t able to talk to many people. They also get to work on speech, getting extra help learning their lines if they need it. Members are given their lines to take home, along with CD clips that will be useful to them. The show will be performed twice on Aug. 8, at 12:30 and 7 p.m. Admission is free. To place an ad in the production’s playbill or to make a donation to support the program, call Castka at (201) 368-8585 or e-mail kcastka@adleraphasiacenter.org. For more information about the Adler Aphasia Center in Maywood or its newest satellite aphasia treatment center in West Orange at JCC MetroWest, go to its website, www.adleraphasiacenter.org or call (201) 368-8585. “Fiddler” is also the play of choice for the Teaneck-based Black Box Studios Musical Theater Camp 2012. Here, its founder and artistic director Matt Okin said, the production will be “more along the lines of punk rock,” featuring 27 performers ages 10 to 19, most from Teaneck and other parts of Bergen County. Okin said the changes help the teens relate to the material better. “The kids relate to these conventions of musical theater more than they do to the musical theater of their grandparents.” They also appreciate the amped-up speed, volume, and intensity of the piece, he said. Black Box Studios provides collaborative theater workshops for students of all ages, backgrounds, and experience levels, Okin said. At the camp, students spend a month working on a Broadway-style musical, culminating in fully staged productions. “Fiddler” is directed by Okin, with musical/vocal direction by Bronwen Mullin and choreography by Giselle D’Souza. Teaching artist Jesse Freedman serves as set designer/dramaturge. 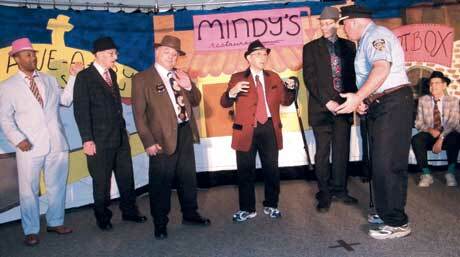 The show will be performed July 17, 18, and 19 at 7 p.m. at the Jewish Center of Teaneck. Tickets are available at www.blackboxnynj.com. Admission is $10 for adults, $5 for students/seniors, with a discount for JCT members.